The other day I was sitting in a taxi in the middle of a traffic jam in Bogotá and, as I’m used to in Colombia already, ‘80s and ‘90s tunes were coming out of the radio. Sinead was singing “nothing compares, nothing compares to you” and in that moment I suddenly felt like I was in Brussels. Nothing compares to you, Brussels – except that Bogotá actually does a bit. I found these similarities between Bogotá and Brussels. Besides the fact that the names of both cities start with letter B, Bogotá and Brussels also share their love of cars. Of course, Bogotá is a huge city with its 8 million people, but it still seems that everyone here has a car. Endless traffic jams on main avenues going through the city – Carrera 7 and Carrera 14 – are basically longer versions of Brussels’ Rue de la Loi. While according to some reports on bad days Brussels can compete with Beijing in air pollution levels, Bogotá’s numbers are even higher. If the annual average of PM2.5 particles is 18.2 micro-grams per square meter in Brussels (and the World Health Organisation’s recommended maximum is 10), Bogotá’s is 30! The effects of traffic described in the previous paragraph can be seen in the late morning and then during the whole day from Cerro de Moserrate, a view point above the city. The haze rarely goes away. 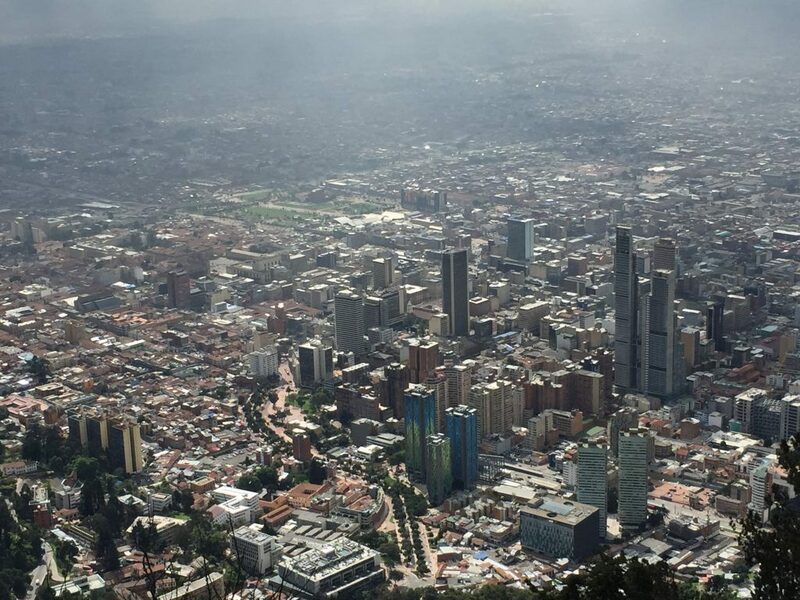 The haze over the city centre of Bogotá, as seen from Cerro de Monserrate. Companies operating public transport in both cities are like two cousins who used to live in the same country but then one of them moved abroad ages ago and adapted the last name a bit so that it would blend in better with the new language. 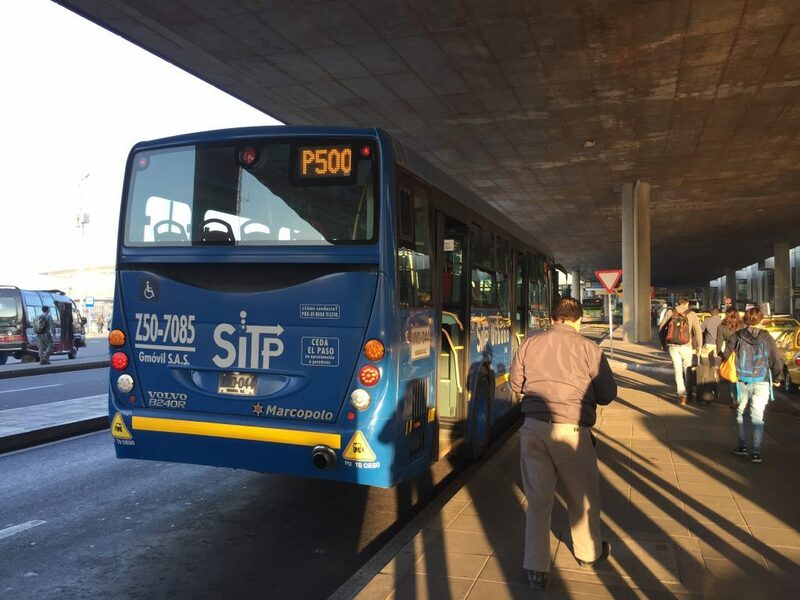 We have STIB in Brussels and SITP in Bogotá. Every time I saw a bus in Bogotá, I had to think of the 21 passing through my Plasky neighbourhood in Brussels. And another one of the similarities between Bogotá and Brussels: both have great public transport services! After drawing a few similarities between both B-cities, I thought that yeah well, both of them are capitals with a lot of people, of course they have some things in common. But then I walked a block in Bogotá after the rain. Jackpot – the cities are basically twins! I’ve seen this occurance so common only in Brussels and Bogotá until now. Stone tiles on pavements sneakily looking more or less ok from afar, but once you step on them – a splash of dirty rain water is reaching up to your thighs. Bruxellois will know what I’m talking about, and I’m sure Bogotános as well. 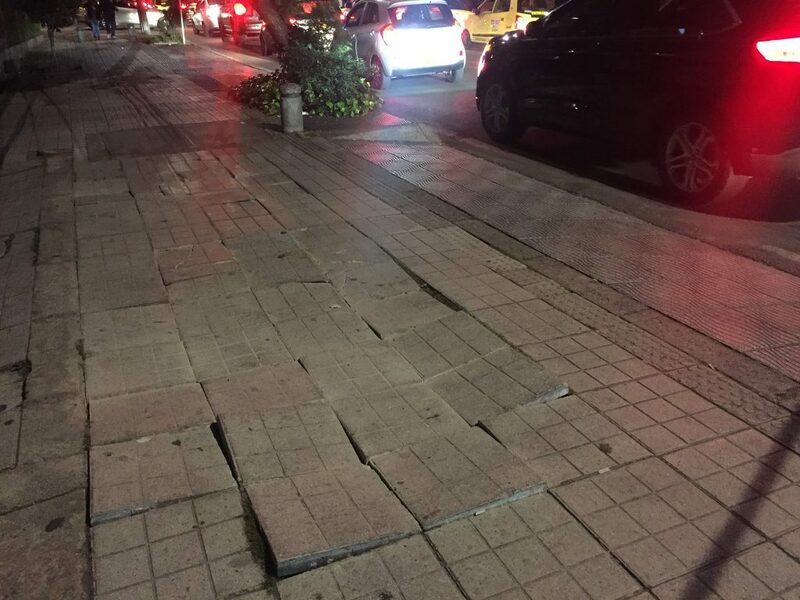 You don’t want to step on these after it rained. I went to Seattle once and everybody told me how the weather there is horrible – it’s cold, rainy, grey and foggy most of the time, they barely get any sun, they said. Well fine, I thought, I live in Brussels and I’m used to that. Then it turned out to be super sunny and hot the three days I was there. Bogotá on the other hand, reminded me so much of Brussels, weather-wise. I was there with my ‘travel the Caribbean’ clothes, so 98% of the time I was freezing cold. There was some sun in the mornings and it would get quite warm, but afternoons were often rainy, and evenings were just plain cold. 10 degrees. Try that in your Caribbean clothes. I’m sure in Bogotá they also get four seasons in one day sometimes, as we do in Brussels. Which is why it felt so much like home to see people wearing short sleeves and sandals and walking next to someone else in a winter jacket, a woolen scarf, a hat and even gloves. Carrera Séptima, one of the big avenues in Bogotá is closed for traffic in the city centre, from Calle 10 to Calle 24. They turned it into a big pedestrian hang-out, with shops, restaurants and bars on both sides of the street. There are street artists performances, kids playing football, people drawing on asphalt with chalk or just spending their afternoons playing chess. Kind of like Anspach in Brussels on a good summer day. 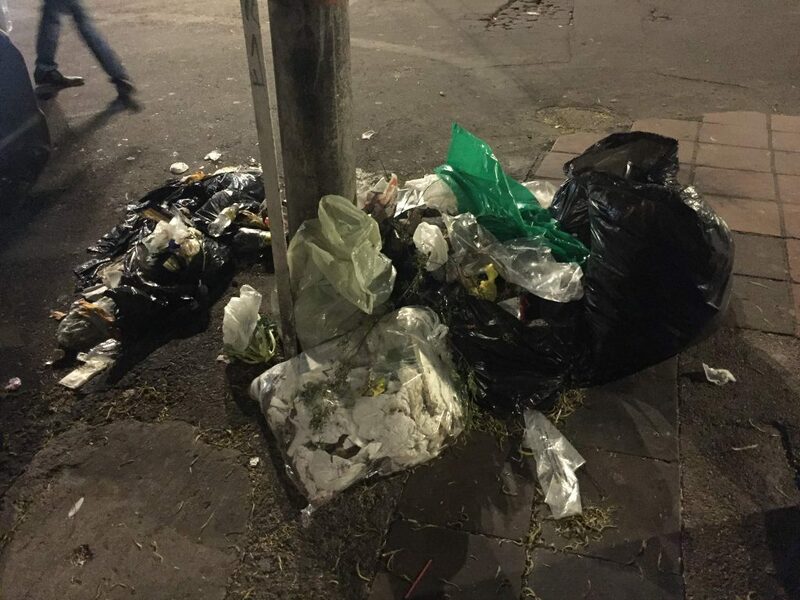 And yes, there is trash thrown around on the ground in Bogotá too, and quite a few homeless people as well, to make it even more like Brussels. 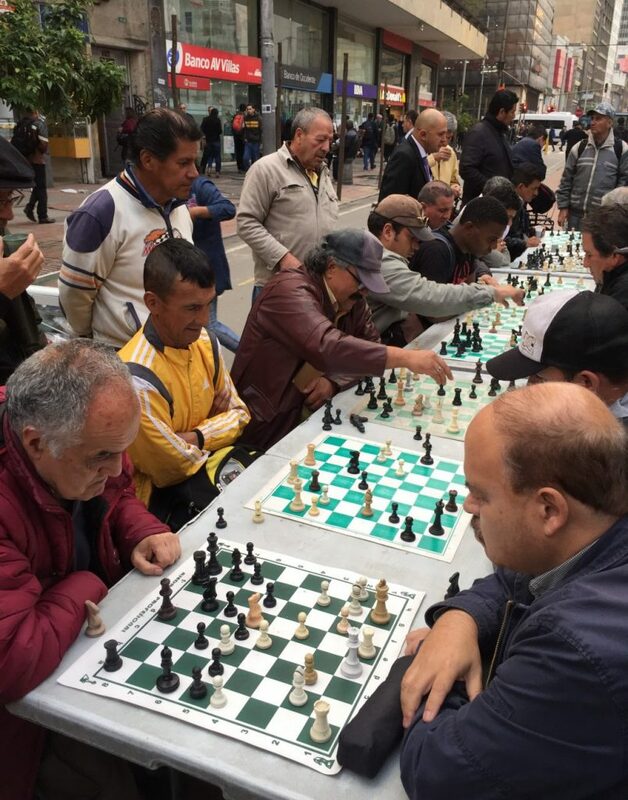 A chess game on the streets of Bogotá. Most of my time in Colombia I spent complaining over Colombian post service (what a great travel companion I am, right?). After I had to cancel my old bank card because of fraud in Guatemala, I was expecting my new one to arrive by post to a hotel in Bogotá. I had it sent with registered mail, so that I could track the letter all the way from Belgium. I checked the tracking system every single day, but after it left Belgium, there was no trace of my letter anymore. I almost gave up three weeks after it was sent; I left the hotel, and I left Bogotá too. 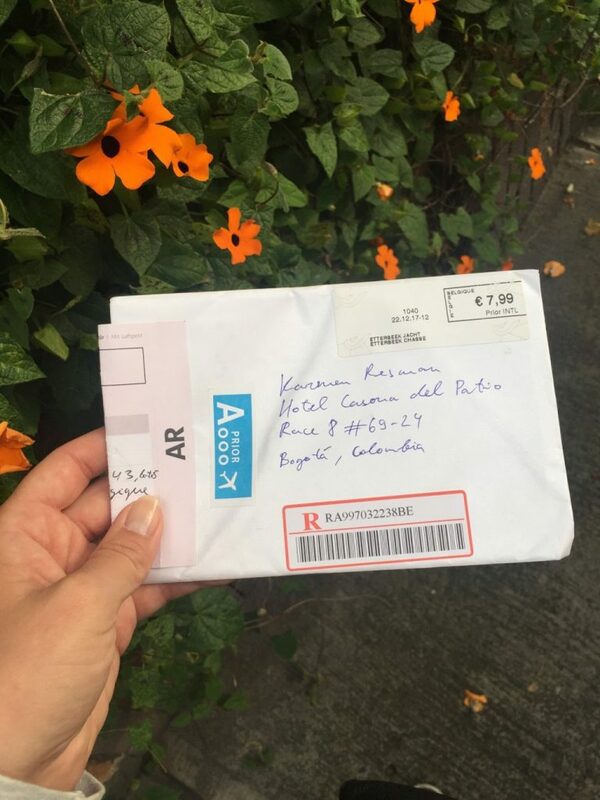 Not sure who I was blaming more for my supposedly lost card: Belgian post, which gave me some grey hair in the last four years already, or Colombian post, which I read is a private company whose last concern in this world is actually delivering mail. After two weeks of travelling around in Colombia I returned to Bogotá for 12 hours to catch a flight out of the country. Just for my peace of mind I passed by the hotel where my card was sent to. What a miracle, all hail to Belgian and Colombian posts – my letter arrived that very morning! On the last possible day! It took them six weeks, but now instead of saying that both Brussels and Bogotá have equally unreliable post service I can say that apprently they both work pretty fine. Slow as hell, but pretty fine.